Mixed groups are challenging in speech therapy. I won't lie. If feel like you need octopus arms and an extra set or two of eyes to shuffle cards and papers and take data all the while you are trying to keep wiggly children engaged in speech therapy(whew! ), you are not alone. Don't worry, I am going to share some of my best secrets to end the madness. Keep reading, I've got you! The reality for most school-based speech-language pathologists is that mixed groups are inevitable. 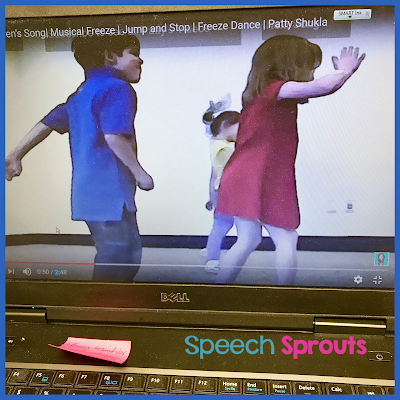 Class schedules, specials schedules, and principal or district mandates on where we can and can't pull a child for speech therapy factor into grouping. Then there's our own juggling act of serving multiple campuses and having limited time at each campus. It pretty much makes mixed groups a certainty in a school setting. Mixed groups can include children of varying ages and grade levels, varying developmental levels and certainly varying IEP goals. Small homogeneous groups are often just not possible. In addition to the diverse needs of these groups, the groups usually end up being bigger than we would like because caseloads for most SLPs are unreasonably large. No-one can serve 70-90 children individually or in small groups. Not. Humanly. Possible. Clone me, please! 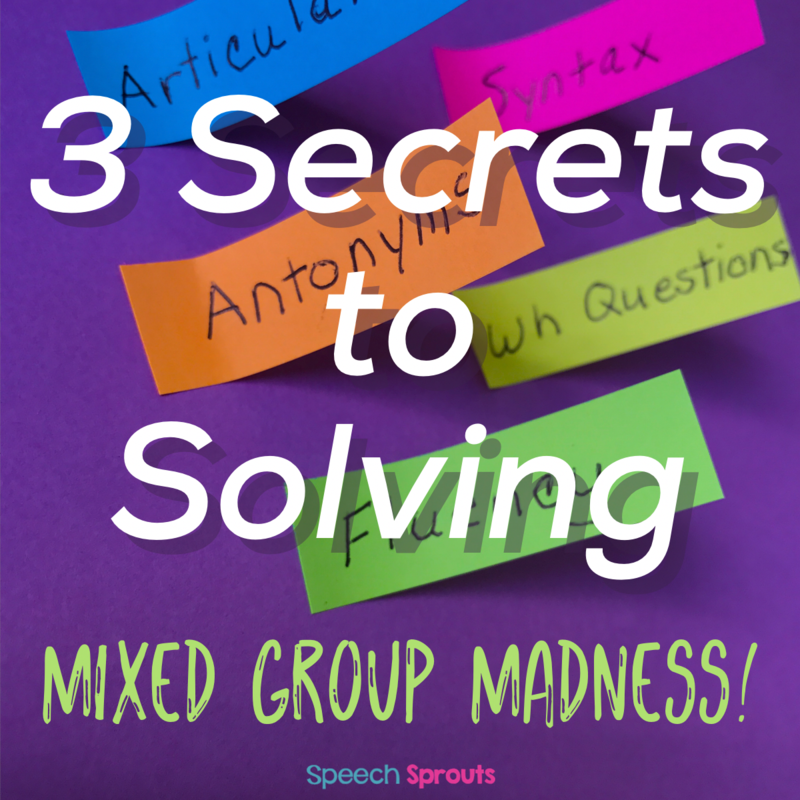 Let's talk about how to conquer mixed groups! Why are mixed groups so difficult, and what can we do to make these groups effective, fun and less stressful for you? 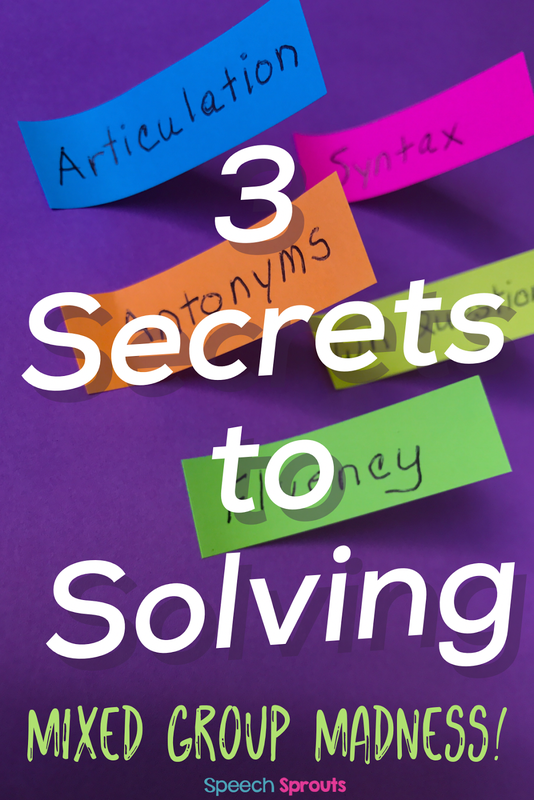 Here are the biggest challenges and the secrets to solving them. The Challenge: Off-task behaviors that happen as children wait for their "turn." When children are bored, they start acting silly or misbehaving. You end up repeatedly correcting inappropriate behaviors that waste precious therapy time. The Fix: Reduce wait time and keep children busy between turns. 1. Read a storybook: Have students retell and act it out. 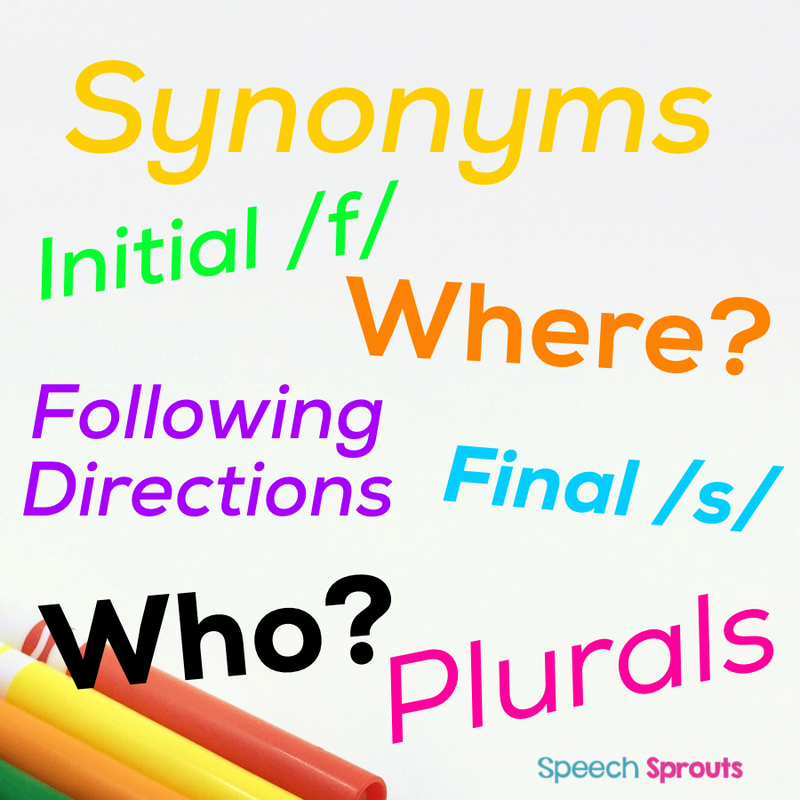 Pick out the vocabulary and words for articulation as you go. Students working on fluency can practice pacing and light contact. You can put a sticky note on the page ahead of time with the articulation or vocabulary targets to remind yourself. If you need a few great book suggestions, check out my Best-Ever Books for Speech Therapy posts. 2. Storybook companions: There are many of these on Teachers pay Teachers. I have created several for you and make sure to pack a ton of targets in each one, so you can pull one pack and done for your caseload. 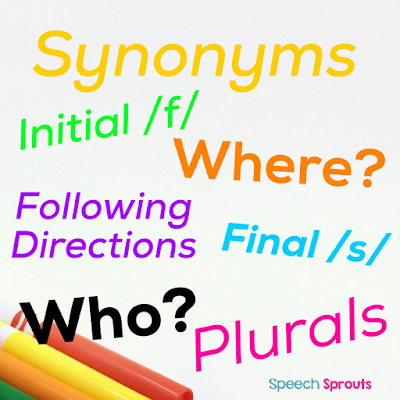 Find these goodies here: Speech Sprouts Book Companions. 3. 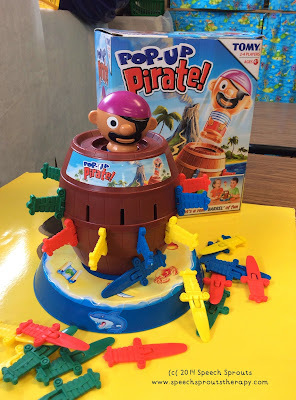 Cooperative games: The Balloon Bop game as described by Teach Hub is great for keeping everyone engaged. Balloon Bop is played by forming a circle holding hands. Keep holding hands and drop a balloon in the middle. The children must keep the balloon in the air, using their feet, knees or bodies. While they are doing this, you go around the circle and prompt each child's goals. How many turns can the whole group complete before the balloon falls to the floor? 4. Games that require children to attend to every turn. Use motivational activities that keep student's brains and hands occupied during wait-time. Choose games that are quick-play. 1. Games: Be sure they are quick-play and don't take much time between turns. 2. Art activities: Try play dough, painting, coloring, dot markers, bendable wax sticks. 3. Construction activities: Give a few legos, pop-together links or other building toys per turn. 4. Puzzles: Give a piece or two of the puzzle per turn. Get children up and moving during the session to burn some energy. Have a 90-second dance party. Yell switch! and everyone has to take a different chair. Turn on one of many music and movement videos on YouTube for a minute or two. I love Patty Shukla's videos such as Jump! for littles. It will give you a workout too! 2. Beanbag Games Toss a bean bag at any target- cards, baskets or even the trash can. Play for points and kids will love it. 3. Go on a Hunt. See how I do an articulation hunt with Wheels on the Bus. You can hide all sorts of things... eggs, stuffed animals, Christmas bows, spider rings, any set of category cards, clues to a hidden treasure. Start by prompting your student with their individual goals, then let them hunt. Put points on each bus or other objects to be hidden. Who can collect the most points? Use a center-based strategy if you have room. Work individually with each child a few minutes and then switch. Put out activities that encourage independent practice at each center. Written practice for older students. Tally counter- how many repetitions of that articulation word can I do? Matching: match association cards, beginning sound cards and more. A tablet with apps and games for vocabulary, phonological awareness, socials skills and more. The Challenge: Addressing multiple goals at once. Addressing multiple goals is a challenge! One student has articulation goals, one is working on antonyms, one on syntax, another student stutters and is working on easy starts. 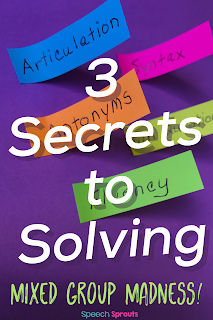 You need prompts for each child ready to go and easy to find, because generating those on the fly for each student will twist your brain up into a knot. The Fix: Keep a list of prompts for each student in front of you as you work. Don't try shuffling papers or flipping through multiple sets of cards or through pages of a book to locate the next prompt for each student. That will drive you crazy! Cards: Many commercial card sets have a summary list or key on a card. Use those in front of you instead of shuffling through each picture card. With just 3 or 4 cards in front of you, you can have a synonym list, an articulation list, etc at your fingertips. Lists: Make a list for each target. Keep the master lists in front of you or place individual lists in front of the student who is working on that skill, so you don't need to visually hunt for the right prompt. If list-making is too time-consuming, try Quick Lists! I am excited to tell you about these! These handy little gems are magic for mixed groups and are no-prep, other than print and cut the lists you need. I designed quick lists specifically to simplify your mixed groups, but they are also terrific for progress monitoring. Just under 2" square, you can easily add the perfect individualized list to any activity. Each list has 6 prompts. 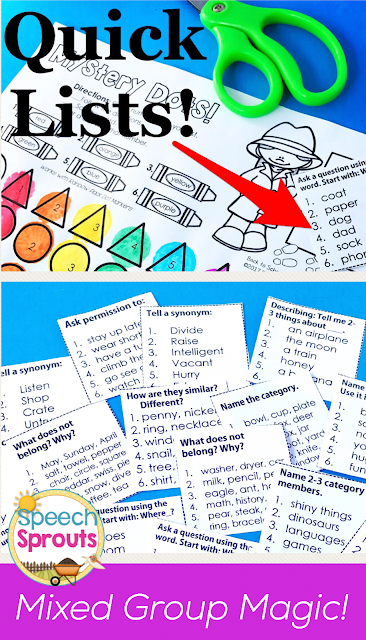 Pop one on an interactive paper activity such as my School-themed Mixed Group Magic Activities, on a master prompt sheet for your group, or simply place it in front of the student as they work on an activity or game. With receptive language, expressive language, and articulation Quick Lists, they will be your no-prep go-to resource all year long. Save now by grabbing the bundle (over 500 lists), and if I add any future Quick Lists, you will get those free! With several students working on different goals in a single session, trying to take data can be difficult, confusing and make your brain hurt. 1. Take data on only one or two students per session. Then rotate and take data on another student or two the next time. 2. Have older students take their own data, then show you at the end of the session, so you can record it. This can be motivating and help them slow down and attend as well. 3. Record the data on one group sheet, then transfer later. Quick Lists have you covered again with this one! Check out this group sheet. 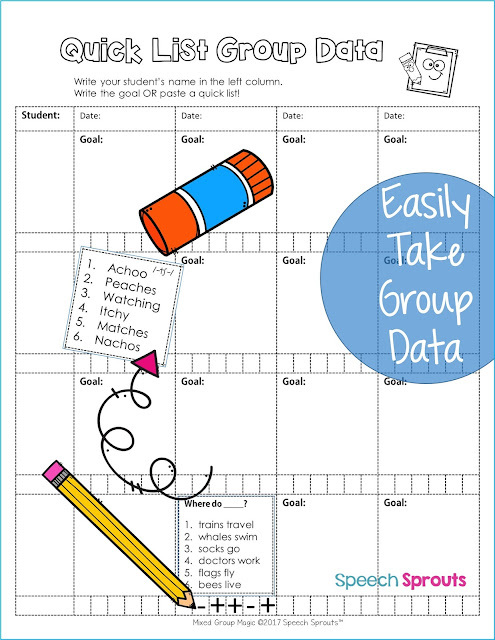 Paste a quick list for each student on it, and you are ready to be a data-taking ninja.The group sheets are included in all Quick List sets. I hope you are feeling better now about your mixed groups. You can do this! My name is Lisette, and I'm a school-based PK-4 speech-language pathologist. 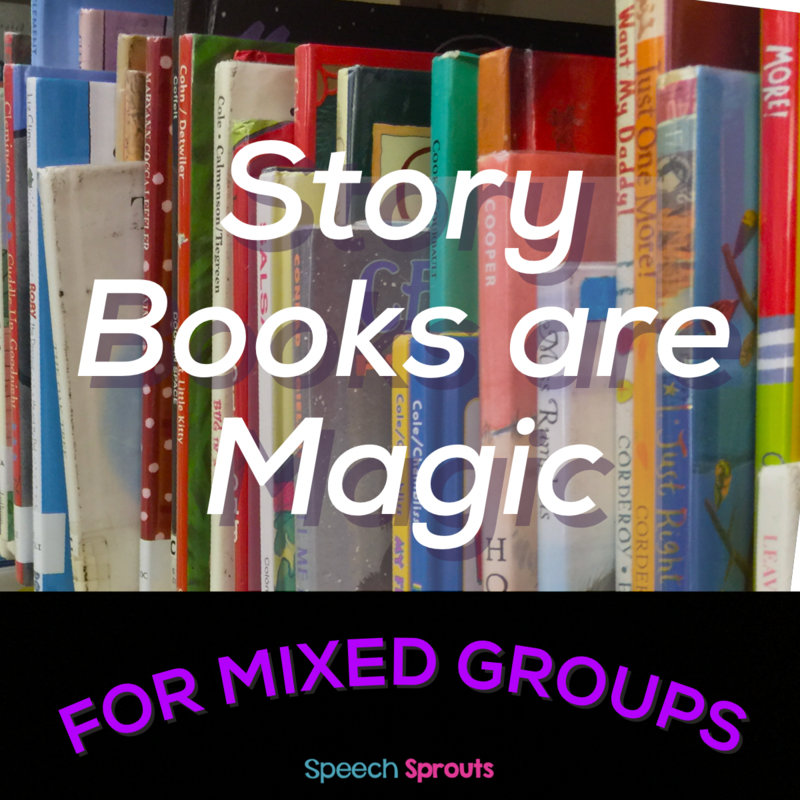 I love helping SLPs take the crazy out of their caseload with therapy tips, storybook ideas and fun themed activities that make planning for mixed groups a snap! Sound-Loaded Storybooks for Articulation- Find 'em Here by Phoneme! 10 Terrific Storybooks for Speech Therapy and How To Use Them. You Have my Permission to pin from this blog, Please give me credit when you do! Click to see more Texas bloggers & get your state button! Best-Ever Books for Basic Concepts: UP! TALL! and HIGH! (c) Lisette Edgar. Powered by Blogger.